Fit, Form, and Functional Replacements from DARE Electronics, Inc.
DARE specializes in designing & manufacturing replacements for old, obsolete, discontinued, or sole-source items. In fact, even our name, DARE, and our double reverse ellipse logo reflect the unique function and challenge we perform in this industry: that of converting many older electromechanical and electronic products into state of the art replacement items that fully satisfy the fit, form and function of their original design. With our extensive library of data on hundreds of old, obsolete, and discontinued products, DARE can keep aging systems up and running and help prevent or eliminate a diminishing manufacturing source (DMS) situation. 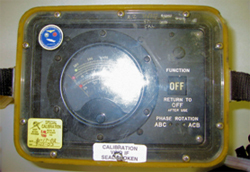 Utilizing current technology, DARE has designed and manufactured hundreds of fit, form, and functional replacements for parts previously manufactured by Airpax, Communication Instruments (CII), Dataproducts of New England (DNE Technologies), Hartman, Hi-G, Leach, Logitek, North American Phillips, Scientific Technologies (STI), Seaboard Electronics, Tempo Instruments, and many others. Whether you have complete specifications for an item or only performance requirements, a sample, or an old part number, DARE may be able to help prevent or solve your DMS or sole source issue. Some of these replacements are shown on our custom designed products page. In addition, DARE has worked with numerous other customers and government agencies to design fit, form, & functional replacements for other old, obsolete, discontinued or sole-source items. 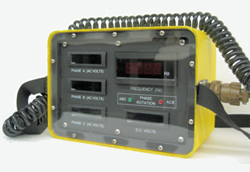 For example, DARE worked with the U.S. Air Force to design a solid-state controlled replacement for an old obsolete mechanical stepper relay. 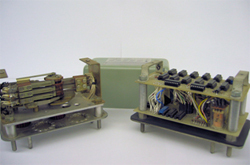 As seen in the photo, the old design used a series of cams; whereas the new design used integrated circuits and electro-mechanical relays to perform the same function. When the cover in the background of the photo is put on the unit and the unit is shipped to the field, the difference is imperceptible but critical. Without the fit, form, and functional replacement, the system would have needed to be scrapped or re-designed. With the fit, form, and functional replacement, the end item was kept fully functional and significant costs associated with a major re-design were avoided. If you need a source for an old, obsolete, discontinued, sole-source or hard-to-find item, call or email us. We would welcome the opportunity to design or manufacture a product to meet your needs.